Four years ago today, I moved into my house. In that time, it’s safe to say that I have fulfilled the cliche and turned this house into a home. I remember the first time I pulled up to it — back when it was still just a house. It was one of those fluffy snowy days in Chicago when the flakes are falling furiously and beautifully and the accumulation is swift. My then-future in-laws had endured the weather to drive up from southern Indiana to check out this house’s potential to be a home for me and their daughter. We weren’t yet engaged, and I already owned a condo in another suburb. My longterm visions had us getting married eventually and her moving into the condo with me, where we would save for a house and move out whenever the timing worked. But when a family friend offered me a once-in-a-lifetime deal on a house in the suburb where I grew up — 10 minutes from my parents’ house — it was too good not to investigate the possibility. The friend was not listing the house, so I hadn’t even seen any prettified, wide-angle real estate photos of the interior, just the Google Street View exteriors, via my limited Internet stalking of the property. I can still remember exploring the largely empty rooms for the first time with my girlfriend — what an odd word to use for her now — trying to picture a future together in rooms that have since been filled with our furniture, our thoughts, our feelings, our offspring and four years’ worth of memories. As I wandered around the basement, growing more fond of the house itself and my imagined version of that future, I remember praying that my Mr. Fix-It father-in-law wouldn’t find any devastating structural dealbreakers. I also remember being silently grateful for my Can’t-Fix-A-Thing self that the house was recently flipped with a new paint job and new appliances. I liked this house. The house ultimately passed the test and has been silent witness to so many momentous and mundane moments of my life ever since. I asked my wife to marry me in the living room. I jokingly carried her through the front doorway on our wedding night. I slept off the effects of chemotherapy in our bedroom and spent six months working remotely from the confines of this house. We keep adding new mementos to our Chicago Cubs bathroom. We have hung wedding photos and baby photos everywhere. We have passionate debates about if or when we should knock out the wall between the living room and the kitchen. Our guest bedroom turned into a nursery where I rock my daughter to sleep every night. My Northwestern University-themed office room turned into the guest bedroom. The office-turned-guest-bedroom is now transforming into another nursery, where I’ll rock my son to sleep. The house is constantly evolving to meet the needs of our home. Our unfinished basement holds memories of our past stacked against the walls. It stores our bikes during the winter. It hides some still unused wedding presents. Most excitingly, it holds the promise of the future evolution of our family. There are new rooms still to be created that will be the setting for even more memories to come. We’ve crammed so much life into this house in four years. While many of those who read this blog might think I started it to document my Hodgkin’s lymphoma cancer treatment, that is certainly not the case. I actually launched it shortly after my 29th birthday as a place to track all the thoughts, changes and experiences I assumed I would have as I embarked on my fourth decade of life. Since that makes this a bit of a birthday blog, it’s only fitting that I write a post today as I turn 33. As I have now reached the second half of my chemotherapy treatment and am on schedule to have fully vanquished Lumpy after my final chemo session on July 20, I am slowly trying to resume my pre-Lumpy way of life. That goes for my blog, too, which was decidedly not a cancer blog before 2015. As such, there are probably going to be more posts about “normal” things mixed in among my usual Lumpdates. (wish I’d thought of that phrase sooner…) Thanks for reading and for your continued prayers and support! It was the spring of 2011–almost exactly four years ago–and Northwestern University had a problem. The school year was rapidly winding down, and the University President wanted a new round of institutional commercials to air on the Big Ten Network and whatever other networks Northwestern sports teams happened to be appearing on. Plans were hastily made with an internal video production group to begin filming the new spots before the school year ended to ensure actual students could be used as extras and realistic b-roll of a crowded campus could be included. 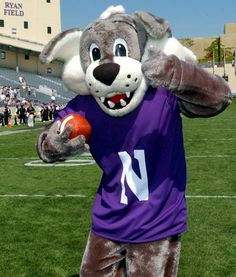 The premise of one of the commercials cast Willie the Wildcat as a Northwestern student and would follow him through some touchstone moments of his experience at NU. The problem was that none of the students who regularly inhabited Willie’s fur would be available at the frequent and random times dictated by the shooting schedule. Never one to shy away from a golden purple opportunity, I quickly volunteered to become Willie for a few weeks and star in the commercial. The identity of Willie is supposed to remain shrouded in mystery, but since these commercials are no longer airing and I no longer work for University Relations, I think I can officially let the (wild)cat out of the bag. What follows are my memories from one of the most unique experiences I had at Northwestern. After we finished reflecting on this psychological report, the Wannabe Willies were then introduced to Willie’s Toys–the various applause-generating gadgets Willie employs during games to get the crowd’s attention. Each one took a turn demonstrating how they would use one of the toys in a creative way. I was very happy to be excused from this exercise. With the method acting lessons complete, Willie’s keeper took me to what is basically the athletic department’s laundry room. Shelves full of purple, N-emblazoned athletic apparel suitable for every sport lined the walls. If my Mom found her way into this room, she would never again have to go Christmas shopping for me and my brothers. We made our way down one aisle of shelves and ended up by a locker with an unmistakable head sitting on top of it. This was the giant-headed Willie of my undergrad days, before he was redesigned to his current form! Inside the locker, I found a few more pieces of Willie that I would be borrowing for the next month, including Willie’s feet (a pair of gym shoes adorned with wildcat fur that comes up around the calf), Willie’s various shirts and jerseys (he often goes around pants-less, but we picked up some basketball shorts from one of the other shelves for one scene of the commercial) and Willie’s hands (there were several pairs of fur-lined black gloves in various stages of ripping, held intact by black duct tape). While I encountered plenty of bad smells during my stint as Willie, the most foul-smelling accoutrement was by far the gloves. I guess you don’t realize how much your hands sweat, and this was one part of the costume that for some reason did not get washed. The mere memory of the smell of those gloves is almost as nausea-inducing to me as chemotherapy. But there were two crucial pieces of Willie left to be found–the body costume and the head. These were located in a duffle bag on wheels, which looked all the more like a body bag when you unzipped it and immediately saw Willie’s lifeless head staring up at you. There was also a set of shoulder pads (which I deemed unnecessary after my first tour as Willie), a loose-fitting swimmer’s cap and a pair of tight biker shorts to wear under the suit (I guess to hold in my sweat?). Later in the week, I returned to this room to obtain the pieces of Willie for the first shoot of the commercial and finally tried on the head. The mask itself is a lot like a catcher’s helmet, with a solid bike helmet that fits over the top of your head and fastens with a chin strap. The catcher’s helmet face mask is replaced by Willie’s face. You can see through the eye holes, but the nose and mouth block your vision of what is immediately in front of you. The mouth hole is your only source of outside air and really only provides relief when you manually hold it open with your hand–which you can’t really do when you’re swaggering around as Willie. There are also flaps of fur on the front and back of the mask that get tucked into the body suit. Consequently, these often sweaty flaps rival the gloves as the worst-smelling-and-most-unable-to-be-cleaned parts of the costume. The solution? Spraying the various parts of the mask with Fabreze. I’ll just let you think about how effective that might be. As I mentioned, the commercial’s premise had Willie the Wildcat experiencing various aspects of Northwestern life. The necessary scenes gave me a preview of what I would be asked to do in the mascot getup: Willie moves into a dorm room, Willie walking around campus, Willie in class, Willie shooting a free throw on the basketball team, Willie performing as part of a string quartet, Willie doing experiments in a lab, Willie hanging out by The Rock and Willie graduating. There was a lot to do and not a lot of time to do it. My Willie debut came with the shooting of the basketball team scene. I had tried the full suit on the night before to make sure everything was ready for its closeup. As it turned out, my six-foot-two frame is probably the upper limit of what the bodysuit costume will allow in terms of height. Even so, I thought I made a pretty decent-looking Willie and the swagger-walk works even better when you’re wearing the suit. I reported to Welsh-Ryan Arena, where the commercial was to be shot with actual members of the basketball team and a crowd of students cheering Willie on as he took his free throws. Well, the basketball team showed up, but even with some NU institutional social media begging and my sending a pleading e-mail to all my former students, only a handful of ‘Cats ventured to take the shuttle ride from campus to the arena to appear in our commercial. As an alum, I can’t understand why students wouldn’t want to be in their school’s commercial…You’d think there would at least be some theater majors that would see it as free face time or something, but we struggled mightily throughout the production to get students to participate. As a last ditch effort to get warm bodies in the bleachers, someone raided the nearby athletic department offices, grabbed some purple apparel (there’s no shortage of that in athletics…) and had the cube-dwellers pull “MAKE SHOTS” t-shirts on over their dress shirts and ties. The few students (including my brother Joe, who ended up appearing in almost every scene in the commercial) and staffers with young faces were ushered to the front rows of the bleachers. The rest were used as purple filler. I didn’t see any of this, however, as I was in the men’s locker room settling into the fur. As I strutted out from under the stands and onto the court, the basketball team was already shooting around and the cameras were lined up. When some of the extras caught site of me, I heard someone yell, “Hey! Willie!” With a wave of my hand to acknowledge the crowd, I knew my ruse was complete. That’s right. I AM Willie. It’s strange how putting on the suit really does change the way people relate to you. Even those who knew it was me called me Willie and seemed to somehow talk to me differently. We also seemed to have a mutual understanding that I was incapable of speaking while wearing the suit. I communicated only through exaggerated nods and frequent thumbs up. The director tossed me a basketball and said I should take some practice free throws while they finished lining up the shot. The basketball team lined up around the key and one of them leans toward me. “You’re tall. Who’s in there? Is that Allison?” No, I’m not Allison. How tall is Allison? At this point, I would like to state for the record that I drained three free throws in a row while dressed like a stuffed wildcat. If only I had worn this costume when I played on my junior high basketball team–my life could have gone completely differently. NU baller Juice Thompson gave me a high five and I was feeling pretty good about my athletic prowess. My luck of course changed significantly when the cameras started rolling. The director instructed the extras to go wild whether my shot went in or not and they managed to get the footage they needed. As I swaggered off the court and wrapped for the day, the cameras set up for a closeup shot of the basketball swishing. Hollywood trickery! When I got back to the locker room and took off the head, I realized that every inch of me was covered in sweat. Fortunately, I had followed Team Willie’s advice and hydrated like crazy all day long, so I wasn’t feeling all that bad. My first Willie romp had been a success. I can’t remember the exact shooting order from here, but I’m pretty sure the science lab scene was next. We managed to get some undergrads to stick around for this one, so there was no need to raid any science offices for extras. I put on the suit again, which included a lab coat and safety goggles this time. The goal of this scene was to get a wide shot of Willie in the lab and a closeup of him swirling purple liquid in a graduated cylinder. The lab was incredibly hot–especially for a wildcat in a lab coat–and the shots seemed to be taking a lot longer to execute this time. By the time we got to the closeup, my arm was incredibly tired from holding the tube above my head and sweat was dripping into my eyes under the mask. I eventually couldn’t hold the graduated cylinder without my arm involuntarily shaking, so we had to resort to a cardinal mascot sin: I took my head off. I know. Terrible. I’m sure it scarred the undergrads in attendance for life, but we got the shot we needed and called it a day. Another memorable scene that was ultimately cut from the final commercial was the string quartet concert. Willie was supposed to play a violin along with real stringed instrument students. For whatever reason, the students were really playing their instruments and the guy in the wildcat costume who couldn’t even see the violin resting on his shoulder was forced to pretend to play while keeping time with them. Couldn’t they have mimed along with me instead?! The best part of this was that most of my coworkers were roped into serving as the audience for this concert. They all knew that I would be playing Willie in the commercial and this unfortunate recital was their only real glimpse of my performance. After numerous uncomfortable takes and lots of resetting of the bow on the violin strings, I managed to keep my Willie head on and my wits about me, but I should have predicted that this segment would hit the cutting room floor. To film the “Willie moves into his dorm residence hall” scene, my family’s minivan was enlisted as the Willie family vehicle and is featured in the opening frames of the final commercial. Since I drove that van to NU throughout my student days, it’s only fitting. This was another difficult scene for me to shoot, as I was carrying fake luggage in a laundry basket as I walked in and out of the residence hall and working up a pretty good sweat. The lack of air coming into the mask was also a problem, and at one point I recall just walking away and tearing the mask off to get some oxygen. I’m not sure there are descriptive enough words in the English language to describe the smell of the Willie head. I would frequently give those pungent fur flaps a couple squirts of Fabreze just before putting it on so that I would smell the tangy chemical stench instead of the putrid odor of rotting Doritos mixed with human sweat. I’m not sure of the source of the rotting Doritos smell (wasn’t me!) and I’m not going to ask around. The most fun scenes to shoot were those that allowed me to be around campus publicly and in the presence of lots of students. Students love Willie, and it was fun to sample that adoration and play into it a bit. The graduation scene we staged on the Norris Student Center lawn was one of the highlights, as the participating seniors were just days away from their actual graduation and many of them wanted photos with Willie in his own cap and gown. And so my days in the Wildcat suit came to an end less than a month after they had begun. The whole thing was a bit of a whirlwind and a physical challenge at times, but it was also one of those bucket list experiences that I never expected and wouldn’t trade. Every time that I see Willie now, I think about the person inside (Allison, perhaps?) and the rotting Doritos and the lack of peripheral vision and the Willie Swagger. It was also cool that a couple of the members of Team Willie seemed to remember me for the rest of their tenure, so Willie sometimes gave me a more knowing high five. For a while, I liked to think about how the sweat from my brow was dried somewhere in that Willie head, but a few months after my stint as Willie, the athletic department purchased a fresh head. While my sweat equity might be a thing of the past, I’ll always have a fun piece of trivia for those “say a fun fact about yourself” icebreakers and I’ll always be a part of Northwestern (commercial) history. Go ‘Cats.